“My Life of Dreams and Revelations from God” from Christian Faith Publishing author Anthony Rolle is the awe-inspiring true story of how a troubled, rebellious youth was steered away from a wayward path in college to become an anointed prophet and end-times leader for God, spurred on by heavenly visions and out-of-body experiences that not only deepened his intimacy with the Holy Spirit, but also opened him to revelations and encounters with the spiritual realm. “My Life of Dreams and Revelations from God”: an inspiring testimony for anointing the reader to God’s purpose and glory. “My Life of Dreams and Revelations from God” is the creation of published author Anthony Rolle, who was born and raised in Miami, Florida, and pursued a basketball career and a rebellious lifestyle in college, a tumultuous time that eventually brought him face to face with God. Published by Christian Faith Publishing, Anthony Rolle’s new book takes the reader on a breathtaking, humbling experience that will enable the Holy Spirit to move in their lives even as their eyes are opened to the spiritual battle all around them. Through these pages, Rolle acts as an inspiring guide and a gentle shepherd for those willing to answer the heavenly call. View a synopsis of “My Life of Dreams and Revelations from God” on YouTube. Consumers can purchase “My Life of Dreams and Revelations from God” at traditional brick & mortar bookstores, or online at Amazon.com, Apple iTunes store, or Barnes and Noble. 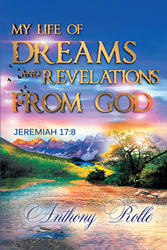 For additional information or inquiries about “My Life of Dreams and Revelations from God”, contact the Christian Faith Publishing media department at 866-554-0919.